Last week, the NBA has two potential game of the year candidate. The Bulls and Pacers battled in an OT game light in big names but heavy in big shots. The far and away leader for the fictional Game of the Year crown is was the game between the Warriors and Rockets. James Harden put on a show in the second half and OT culminating in a game-winning shot over two Warriors. The NBA needs to relax because a new contender for Game of the Year has arrived. The Spurs and Thunder played one of the most intense, fun and exciting games of basketball this season. It featured everything that an NBA fan would want in a game. The Spurs started off the game on fire. They hit their first 14 (!!!) threes of the game. They finished with a 16/19 shooting from beyond the arc. That 84.2% clip is the highest since 2005. San Antonio’s outside shooting helped propel them to an early double-digit lead, a deficit that OKC had to overcome throughout the game. The Thunder needed big games from their superstars and several key players to overcome the hot-shooting Spurs (more on this later). Down by seven points late in the fourth quarter, the Thunder got to within one point with back-to-back three-pointers from Jerami Grant and Terrance Ferguson off passes by Russell Westbrook. Derrick White hit a tough fade away jumper to increase San Antonio’s lead back to three. Westbrook continued to create for the rest of the team, passing up an open trey to find the hot hand in Ferguson. White and Westbrook traded baskets leading to the final moments of the game. Regulation ended when Paul George got a crucial steal on Marco Bellineli leading to the game-tying basket. Aldridge powered the Spurs in the first OT, leading them to a four-point lead. The Thunder mounted another comeback with baskets by Grant and Steven Adams, created by Westbrook once again. In the second OT, the Spurs took over for good. George was called for a technical foul giving San Antonio a free throw to take the lead. White nailed a jumper to extend the Spurs lead and Aldridge found DeMar DeRozan for a bucket inside to extend the lead to a two-possession game. That was too much for OKC to overcome. Aldridge was an unstoppable beast in the game today. He set a new career-high with 56 points on 20/33 shooting. He also had nine rebounds and four blocks cementing his dominance inside. White also stepped up with 23 points, eight assists and several big shots in the closing moments of the game. 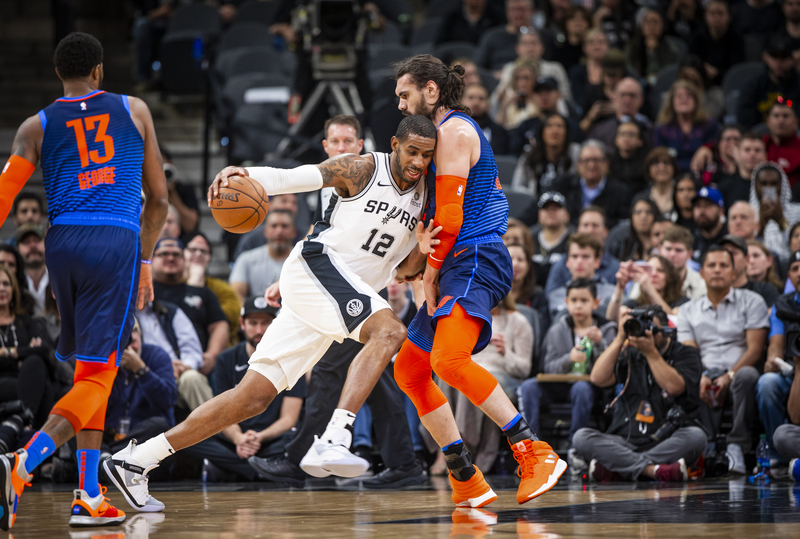 The Spurs and Thunder combined for 301 points, the first time two teams have combined for more than 300 points since the Suns and Nets combined for 318 points back in 2006. This game was also a historic win for Gregg Popovich. He moved up to third in the All-Time wins list with his 1,222st win of his career. This game had it all. Big name, big moments, big numbers and a big win for the Spurs over a strong Thunder team. The Spurs got the big win but the Thunder shouldn’t hang their heads. Westbrook, George, Grant and Ferguson all had big numbers to lead OKC. George had 30 points, eight rebounds and three steals to lead the Thunder in scoring. Westbrook had an unreal triple-double. He had 24 points, 24 assists and 13 rebounds. Westbrook played one of his best games in a long time. He made all the right decisions and found his guys in fourth quarter and the first OT. Grant scored a career-high 25 points while Ferguson added 21. Can you name another player who can grab a rebound with one hand, turn mid-air and throw a pinpoint one-handed, baseball pass from three-quarters court. Look at this. Jamal Murray didn’t even have to dribble anymore. Jokic finished with 18 points, 14 rebounds and 10 assists, his second straight triple-double game.